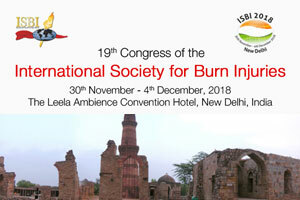 New Delhi: The 19th Congress of the International Society for Burn Injuries (ISBI) will be held in New Delhi, India from November 30 – December 4, 2018. The prestigious global congress will bring together experts from around the globe to deliberate on burn treatment, rehabilitation and management. The ISBI Congress aims to promote the concept of one world and one standard of care for those patients suffering from thermal injury. The educational program will contain several plenary, concurrent and poster sessions, with topics of interest for every participant and every professional who is associated with, or a member of a burn care team. As in past years, ISBI will be awarding many prizes and awards which include 6 Young Investigators Prizes, the Baskent University/ ISBI Nursing Award and the Zagame Rehabilitation Specialist Award. “We are excited to hold this international congress in India. It will provide a unique opportunity to exchange knowledge and learn from international experts in the field of burn care,” Dr RB Ahuja, Immediate Past President, International Society for Burn Injuries informed Medical Dialogues team.